This July newsletter our team rounded up the best blogs for anyone interested in learning more about data science. Whatever your experience level in data science or someone who’s just heard of the field these blogs provide enough detail and context for you to understand what you’re reading. 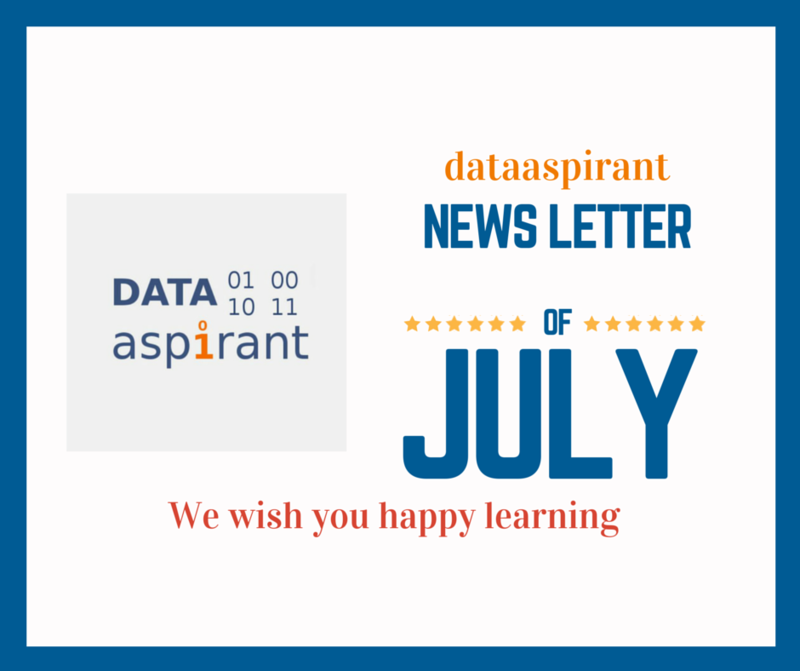 We hope you will enjoy July dataaspirant newsletter. When a Machine Learning PhD student at University of Montreal starts using Tinder, he soon realizes that something is missing in the dating app – the ability to predict to which girls he is attracted. Harm de Vries applies Deep Learning to assist in the pursuit of the perfect match. The lives of people on GitHub doesn’t appear to as tempting as you would observe on other platforms, but if you love coding, programming and data science, you’ll surely enjoy the company of 9 million users on this platform! Following influencers is usually a good practice. It has helped me in multiple ways. 3. What is data science? Why study data science? “Data Science is extraction of knowledge from data”. “By combining aspects of statistics, computer science, applied mathematics, and visualization, data science can turn the vast amounts of data the digital age generates into new insights and new knowledge”. Imagine a baby coming into the world. From the moment she opens her eyes, there is a world of learning to absorb. Every action will create an imprint on her brain, and she will not stop learning until the moment she leaves the world. She develops because of her environment, because of the things she studied, the books she read, the work she carried out, the people she talked with, etc. Now, imagine an artificial neural network – that learns and draws its own conclusions. Similar in some ways to a human brain, but far easier to program, and with a limitless potential for growth. It analyses arrays of data – looking at inputs and outputs. If a cat is thrown into some water, it won’t be too happy. A deep learning array could work that one out without breaking a sweat. With the advent of new technologies, there has been an increase in the number of data sources. Web server logs, machine log files, user activity on social media, recording a user’s clicks on the website and many other data sources have caused an exponential growth of data. Individually this content may not be very large, but when taken across billions of users, it produces terabytes or petabytes of data. For example, Facebook is collecting 500 terabytes(TB) of data everyday with more than 950 million users. Such a massive amount of data which is not only structured but also unstructured and semi-structured is considered under the roof known as Big Data. Both R and Python are incredibly good tools to manipulate your data and their integration is becoming increasingly important1. The latest tool for data manipulation in R is Dplyr2 whilst Python relies onPandas3. This blog post show you the fundamental primitives to manipulate your dataframes using both libraries highlighting their major advantages and disadvantages. This blog post is complex as it arcs over multiple topics in order to unify them into a coherent framework of thought. I have tried to make this article as readable as possible, but I might have not succeeded in all places. Thus, if you find yourself in an unclear passage it might become clearer a few paragraphs down the road where I pick up the thought again and integrate it with another discipline. That’s all for July 2015 newsletter. Please leave your suggestions on newsletter in the comment box so that we improve for next month newsletter. To get total dataaspirant newsletters you can visit monthly newsletter page. Subscribe to our blog so that every month you get our news letter in your inbox.